A “motor mount” UHMW bracket was wearing prematurely in a cedar mill application. It was a 2 piece UH bearing that supported a diverter arm assembly that rotates about 45 degrees. It was operated by an air system which had very fast movement and impact. The shaft was also a Schedule 80 Pipe that had the arms welded on in-house and thus was not perfectly straight. The shaft had five mount points and the original parts were replaced every 6-8 weeks. They wanted a solution that would take the impact and also compensate for the pipe variation. 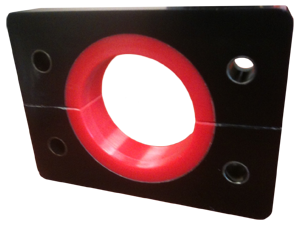 The solution was a Redco urethane unit design with a 750 (hardness) inner ring for the wear point, an 80A(hardness) outer shell for the impact with metal inserts to allow for a solid mount. The new Redco urethane parts vastly outlasted the UHMW parts and over 100 parts have now been replaced with the new Redco urethane bracket.